[ARCHIVED THREAD] - Need Help finding an extended 74 style Muzzle brake for new SLR106-62 Pics added !! 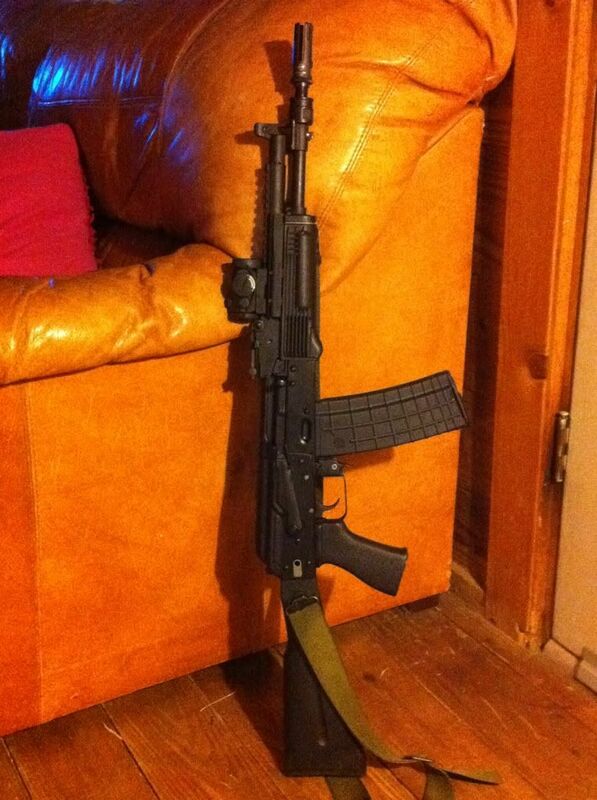 I picked up my new Arsenal SLR 106-62 with a 4.5" screwed on Flash suppressor . It looks like it would not be any help on being an effective brake or flash suppressor. It screws on and looks like those on the Krinks but runs the full length of the barrel . . I am hoping someone makes a longer more effective muzzle brake. ie 74 style , surefire etc atleast 5" or 5.5" so as to extend beyond the lenght of the barrel. Here are some pics notice how the barrel extends through the Muzzle device like a barrel shroud with only 1/4 inch of the device extending beyond the barrel ! There's an AK brake/booster thing made in the US that looks like the combination of a 74 style brake and the protruding cone on a Krink booster. It's made to keep the barrel length at 16'', while the barrel itself is cut down to the correct 12.5''. The only reason for the extended "Krink" booster you have is aesthetics. Remove the current shroud, thread the end of the barrel, and install muzzle device of your choice. "Tactical" is a mindset, not an equipment list. Thanks for the info AEnemaBay !! I just assumed the muzzle device described by the vendor was long enough to operate effeciently as a brake and not a shroud . Had they described the device as a shroud I would not have bought the gun and opted for something else with a working brake . i guess it's ok if I call myself a dufas for not figuring this out first ! I don't know if you really have to cut your barrel down, as it's 4 3/4'' long(compared to the Arsenal shroud you're saying is 4 1/2"), but it threads onto the FSB and I imagine it's pretty simple to chop your barrel, or at the very least, cheaper to have done than having your barrel threaded.